Yet I discovered that it never hurts to have a few things that make you feel a little more comfortable. 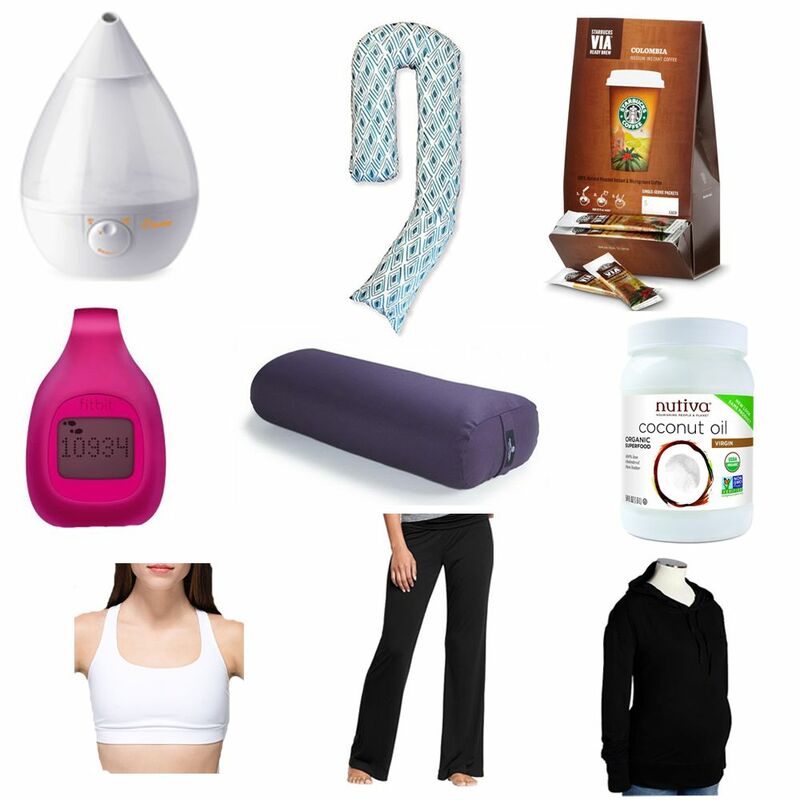 I never could’ve anticipated that these items would be on my list, but with some trial and error I’ve found that they help me sleep better, stress less, move more, and feel better overall. And I think it’s thanks, in part, to these items that I’ve felt pretty darn good throughout my pregnancy. I’m crossing my fingers that they’ll help me sail through these final weeks. Crane Cool Mist Humidifer There are some things nobody tells you about pregnancy, but are incredibly common. Like how you might get bloody noses all the time. I’ve been (un)lucky enough to experience them often. We finally got a humidifier in our bedroom that we use at night and I’ve noticed a huge difference ever since. Thank goodness. Starbucks VIA Instant Coffee Once I started liking coffee again, I made the informed personal decision to enjoy one cup per day. The problem is that it’s incredibly difficult to make one good tasting cup of coffee with a regular coffee maker or a French press. Instead of spending $2 a day for a cup at the pie shop a block away or $4 for a latte at Starbucks (though I’ve been known to do both from time to time), I discovered that Starbucks instant coffee is actually very delicious, convenient, and more affordable. Instant coffee has come a long way. Fitbit Zip The Zip is basically a fancy pedometer. Since my main activities have been prenatal yoga and walking, I wanted to be sure I was getting in enough steps/activity per day. The Zip helps me keep track of that. Whenever I’m shy of my 10,000 steps per day goal, seeing that number encourages me to fit in some additional movement. I’m quite proud of the day I hit more than 22,000 steps! Hugger Mugger Yoga Bolster I’ve had this bolster for years and only used it occasionally. Now? I keep it in our living room and use it almost daily. I’ve been fortunate to not have too many aches and pains, but I have experienced some low back pain and even a few days where I had full on back spasms. Not fun. The ONLY thing that helped was lying on the bolster in reclining bound angle pose. It helps relieve compression in my back, as well as open up my hips, chest, and shoulders, which often feel tight. Surprisingly, I’ve also found that the bolster is super helpful whenever I have heartburn. For some reason, I don’t get a burning in my chest as much as I feel it in my upper back, behind my heart. Lying over the bolster in the same position with a pillow propped under my head has been a lifesaver. Coconut Oil I haven’t been too worried about stretch marks. If they happen, so be it. However, a few months ago I discovered the awesomeness that is coconut oil–for your skin. It makes your skin so soft and of course it smells delicious. I keep a jar by my bed and rub it on my belly most nights before I go to sleep. So far, I haven’t noticed any stretch marks (whether I can attribute that to the coconut oil, genetics, or my super pale skin, I have no idea.) But I think the coconut oil has been especially helpful for minimizing any itching that occurs as the skin on my belly stretches. Lululemon Energy Bra I LIVE in this bra. I have two and it’s a sad day when I’m washing both at the same time. It’s super supportive without being too tight in the upper rib cage or shoulders, which is a rare combination. A word to any newly pregnant ladies: As soon as you outgrow your current bras get new ones ASAP even if you have to go up a size more than once. I waited way too long and can honestly say that I felt 100 percent happier when I finally found what worked for me. For regular bras, I like the hidden underwire ones from Gap. The underwire is great for support, but doesn’t cut into you like other underwires do. Old Navy Rollover-Waist Jersey Lounge Pants (not maternity) and Old Navy Maternity Super-Soft Hoodie Welcome to my uniform. I have two pairs of the black pants and the tops in three different colors and I wear them pretty much every day of the week. Although the pants aren’t maternity, they’re perfect – the waist hits right below my belly so there’s absolutely no pressure on it. I love my Lululemon leggings and Groove pants as much as the next gal, but I found that as I got bigger, the rise was too high and put too much pressure on my tummy. And these hoodies are just as soft as their name implies. There’s plenty of room in the torso to accommodate growth, yet they don’t make me feel like I’m wearing a tent or come down to my knees. I’m sure I’ll still get plenty of use out of both of these items long after baby arrives. This entry was posted in Pregnancy & Baby on January 27, 2015 by Paige Greenfield.